Toward the end of each year, SF Department of the Environment (SF Environment), which runs the Integrated Pest Management Program (IPM) holds an important public meeting. This year, it’s on December 20, 5-7 p.m. in Room 400 at San Francisco’s City Hall. This meeting is to discuss three things, and take public comments and input: Changes to the approved list of pesticides for city use; the guidelines for pesticides use and public notification; and explaining the exemptions granted in 2017 to the rules. 1. Changes to the approved list of pesticides for use on city properties. 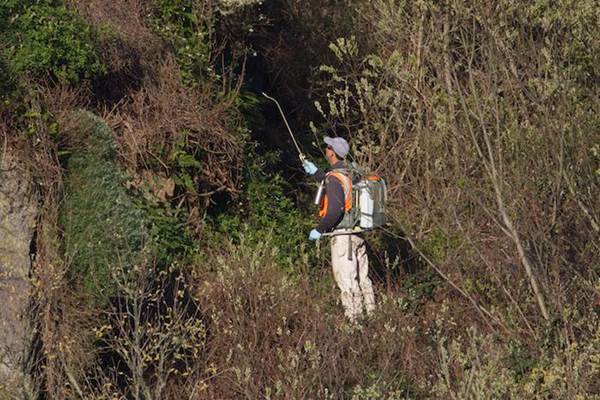 SF Environment publishes a list of pesticides that are okay to use on city-owned properties (our parks, lands owned by the Public Utilities Commission, Crystal Springs, the airport, Sharp Park and a few others). It divides these permitted pesticides into three tiers: Tier III (Least Hazardous), Tier II (More Hazardous) and Tier I (Most Hazardous). This meeting discusses pesticides added, removed, or having their Tier classification changed. 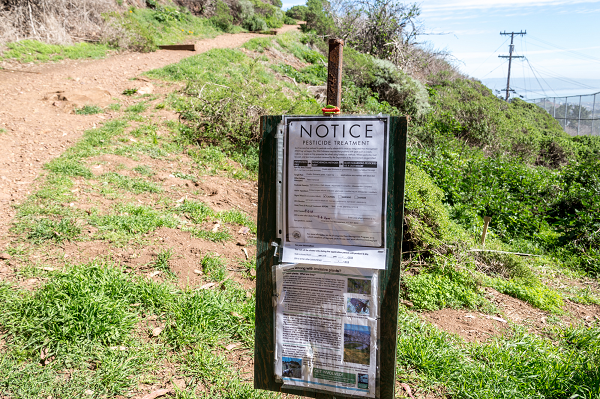 The one that particularly concerns us is permission to use Garlon 4 Ultra (probably the most toxic herbicide still permitted on City properties) on oxalis within fifteen feet of designated trails at Twin Peaks, Mount Davidson, McLaren Park, Bayview Hill and Corona Heights. They argue: These parks have a diversity of native plants growing adjacent to trails including but not limited to: Grindelia hirsutula (gumplant), coast rock cress (Arabis blepharophylla), Pacific reed grass (Calamagrostis nutkaensis), stonecrop (Sedum spathulifolium), meadow white (Cerastium arvense), silver bush lupine (Lupinus albifrons), Mission bells (Fritilaria affinis), footsteps of spring (Sanicula arctopides), California buckwheat (Erigonium latifolium), soap plant (Chlorogalum pomeridianum), dichondra (Dichondra donelliana), varied lupine (Lupinus variicolor), California buttercup (Ranunculus californicus), checkerbloom (Sidalcea malvaeflora), campion flower (Silene scouleri) and coast red onion (Allium dichlamydeum). Many of these plants are considered sensitive species and some of them support important local wildlife, such as the lupine species that are host plants for the endangered Mission blue butterfly (Icaricia icariodes missionensis). SFRPD is obligated to manage the land at Twin Peaks for the Mission blue butterfly as part of the Recovery Plan with the U. S. Fish and Wildlife Service, including the management of oxalis. 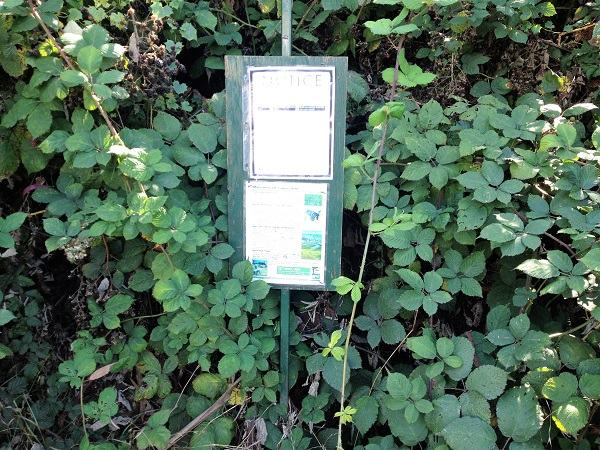 In recent years, Garlon 4 Ultra is being used to protect these sensitive areas from this invasive weed. The Oxalis pes-caprae is a major threat to the existing biodiversity of wildlife within the native grasslands. If left untreated these areas will greatly interfere with the progress already made in controlling this particular weed. We understand that some opinions are influential even when opposing evidence surfaces, but in this case the tradeoff is the continued use of the most toxic herbicide that the city allows on its land. We’ve argued before that this tradeoff is not good for people, wildlife, or the environment. (See our presentation-format post: Garlon v. Oxalis in 10 Easy Slides ) We certainly do not wish it to be used near any trail where people go out with their kids and pets. San Francisco Forest Alliance stands for an end to toxic pesticides in our parks. 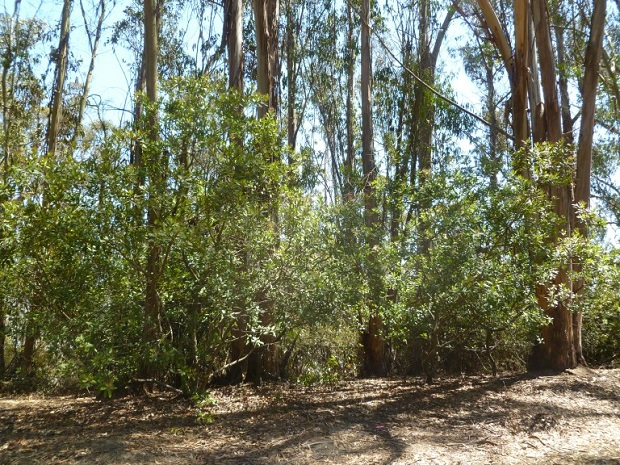 This can be done; the Marin Municipal Water District stopped using herbicides altogether some years ago. It means having a more practical approach to managing the landscape, and not declaring war on various species of plant. There is only one exemption from the posting requirements. It is for PUC right of ways. I understood pesticides were used at the GGP plant nursery without posting. Where is the exemption? I suspect herbicides are applied above the reservoir at 7th and Clarendon without posting. Where is the exemption for that? A2 Why are applications done by methods other than spray exempted from the requirement to use blue dye? If a stump has been daubed rather than sprayed, how will people know it’s not safe to sit on? A2 Why say, “or in cases where posting is not otherwise required under the law”? Posting is always required by law, unless an exemption from posting is granted by IPM. Right now there is only one posting exemption on the IPM Exemptions log. If and when IPM issues another posting exemption, the land manager can also request an exemption from the blue marker dye requirement if there is a good reason to avoid the dye. Who does not want to use blue dye? Is it really expensive? Isn’t it beneficial to the people applying herbicides to be able to see what they already treated? Why shouldn’t people be able to see what was treated? A7 Why can’t herbicides be used on green walls and green roofs? Whatever that logic is, why doesn’t it apply more broadly? B9 Why don’t the protections for the public and employees extend to areas outside city limits? Do we only care about people in San Francisco? B9 What is the relevance of public accessibility? The Chapter 3 of the San Francisco environment code protects City employees as well as the public. If “publicly inaccessible parcels” are to have lesser requirements for posting and demarcation, the law requires that the land manager apply for an exemption. As of today, there is only one posting exemption on file, for PUC rights of way. There should also be one for the GGP nursery. Other than that, we are not aware of any other “publicly inaccessible parcels” in the City. The general exception for “publicly inaccessible parcels” should be removed. It just introduces unnecessary ambiguity. If there is a genuinely publicly inaccessible parcel, and City employees can be protected, then IPM can issue an exception for that. B9 Why are golf courses and areas managed for habitat conservation afforded less public protection? Don’t golfers, kids and hikers deserve protection too? Maybe the behavior of golfers is predictable, but people enjoying our wild parkland could be having a picnic, playing hide and seek, exploring, rolling down a hill, doing almost anything. There should be no exception to the demarcation requirements for “areas managed for habitat conservation”. B12 If a trail exists, especially one not “actively maintained by City operations”, it is because people use it frequently. If the intent of these rules is to protect the public, all trails should be afforded the same protection. If the intent of these rules is to make life easy for land managers and punish people who use un-designated trails, you are on the right track. B13 Please remove spray boom “definition” for broadcast spraying. The last part of the second sentence gets to the point, broadcast spraying means indiscriminately spraying all plants in an area, as opposed to targeting specific plants. In 2016 you saw video and photographic evidence that three men with backpack sprayers can perform broadcast spraying. Please use the definition for broadcast spraying that the rest of the world uses. The new Restrictions do away with the idea that Tier I herbicides are only to be used when there is a critical need. Now Tier I can be used for anything except for prohibitions 10,11 & 12. The old restrictions limited where Tier I herbicides could be used based on a “need” that was balanced against the risks of use. Where has that gone? This seems like a real step backward. 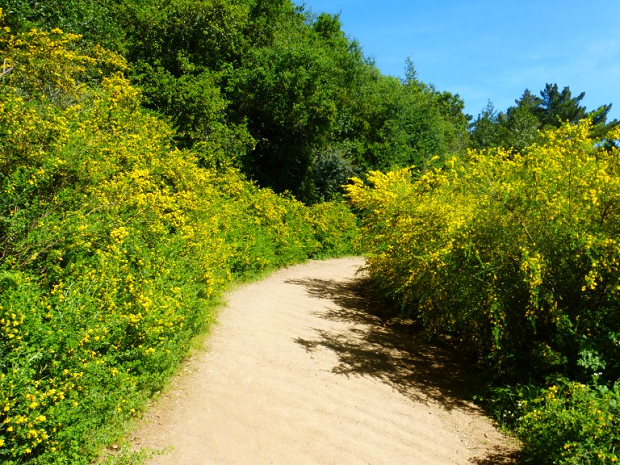 Now land managers just need a reason that goes beyond cosmetics and they can apply Tier I herbicides anywhere as long as it is more than 15 feet from an area frequented by children and more than 15 feet from the land manager’s designated trails. While we work toward the “No toxic pesticides in our parks” goal, we try to attend these meetings and believe that we have been able to work with SF Environment over the years to get some improvements. SFRPD improved the signage for pesticide use, and is now encoding the use of colored dye to show where actual spraying has taken place. More practical restrictions on pesticide use. We’ve received the pesticide usage reports for the first ten months of 2017, and we’re concerned. After reducing herbicide usage in the last four years, it’s creeping up again in the natural areas. The Natural Areas (now called the Natural Resources Department) has already used more herbicides (measured by active ingredient) than in all of 2016. It hasn’t reached 2015 levels, but park users hoped for further reduction, not an expansion in herbicide use. 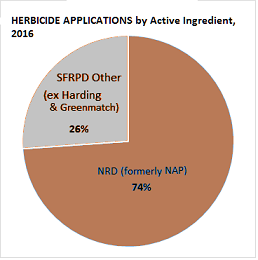 The unnaturally-named Natural Resources division (NRD) of the San Francisco Recreation and Parks Department (SFRPD) used more Tier I herbicides than the rest of SFRPD put together (excluding Harding Golf course, which is managed under a separate PGA contract – but including all the other city-owned golf courses). In fact, in the first ten months of 2017, NRD used 69% of the Roundup and 100% of the Garlon used by SFRPD. 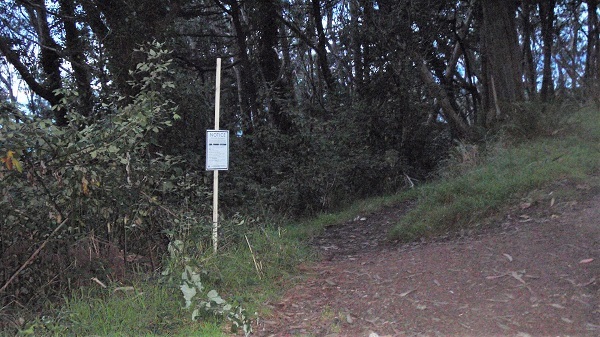 Laguna Honda (PUC property – 13 times). 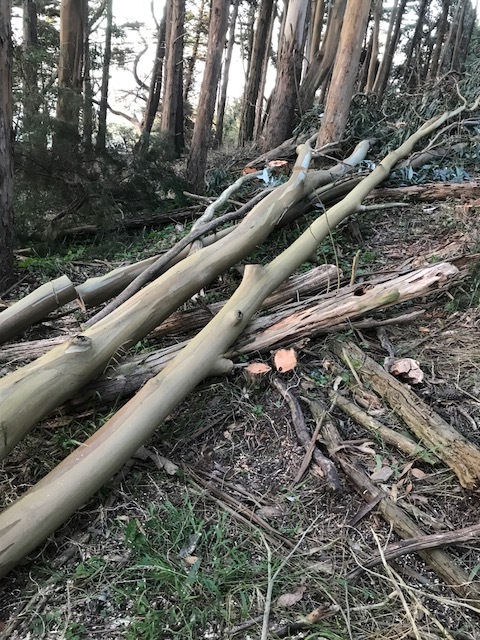 Other parks that got sprayed over five times in ten months were Mt Davidson (8 times); Marietta (a PUC property – 8 times); and Lake Merced, also 8 times. 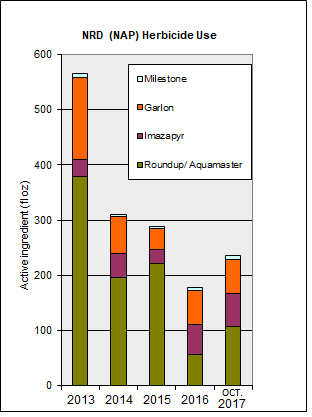 We especially noted that its usage of glyphosate (Roundup/ Aquamaster) has nearly doubled from 2016 (i.e., in ten months, NRD used nearly twice as much glyphosate as in the whole of 2016). This is the first time since the report came out we’ve seen an increase in its use. NRD uses this on oxalis, an early spring-flowering plant beloved of children, pollinators, and wildlife – and the general public, who enjoy its bright blooms as a sign of spring. 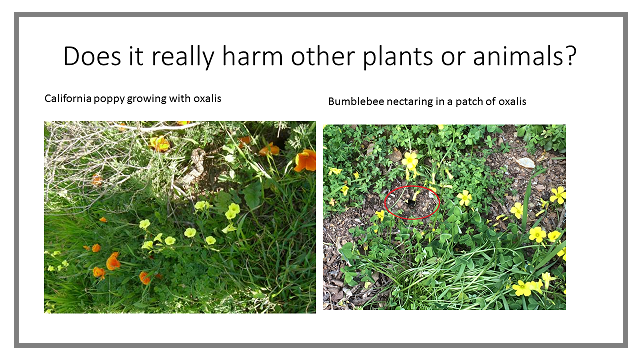 It’s the only use of Garlon by NRD, and if they abandoned the vendetta against these Bermuda buttercups, they would not need to use this awful pesticide. Meanwhile, there’s a new city-wide war on a naturalized species: against arctotheca, or Cape Marigold. It’s another yellow-flowering plant that grows all over our city’s parks, and it’s on the list of 40 species (and counting) that the NRD wants to poison. 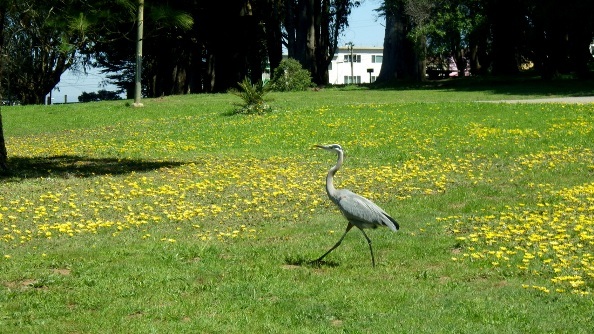 Here’s a picture from McLaren Park (together with Great Blue Heron that’s probably hunting gophers). 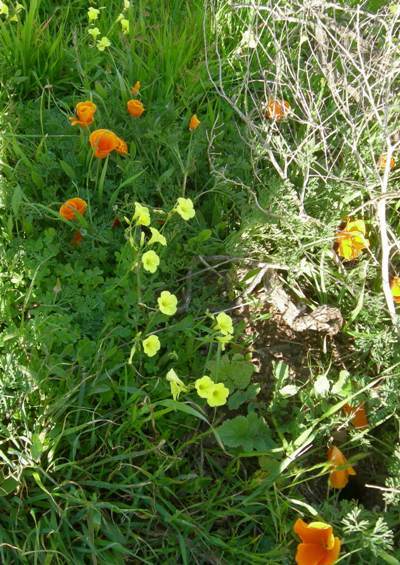 Cape Marigold occurs in both a fertile and an infertile form; both are considered only Moderately invasive by the California Invasive Plant Council – as is oxalis. 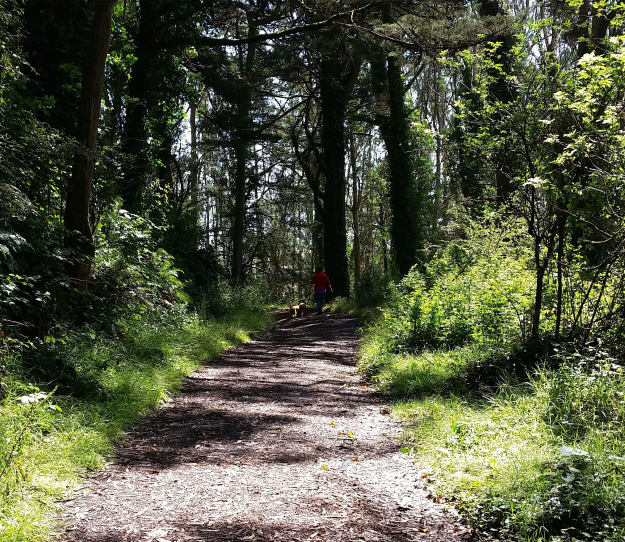 Unless NRD changes its approach and objectives to naturalized species of plants – and recognizes the need for inclusiveness in natural areas – there is little likelihood of eliminating pesticides from our parks. Aggressive management will inexorably result in increased herbicide use. WHAT ABOUT THE REST OF SFRPD? By contrast, the rest of SFRPD (excluding Harding Golf Course) seems to be on track to reduce usage again from 2016. For which kudos! The only department besides Natural Resources to regularly use pesticides is the Golden Gate Nursery. They wish to make sure the nursery stock they supply is pest-free before propagating it. This is less of a concern than NRD for several reasons: It’s not a public space, usage is confined in a small area and not on parks and hillsides where chemicals could spread to other areas. We are concerned, though, that they are experimenting with several herbicides that were not earlier on SF Environment’s list: Axxe, Suppress, Clearcast and Finale. They are all considered Tier II, according to Dr Chris Geiger of SF Environment’s IPM. Of these Axxe and Suppress seem to be less harmful. Suppress is considered acceptable for organic farming. Both these pesticides have cautions regarding potential harm from immediate exposure. We will further research them, but more than the specifics, we’re concerned at the direction. Rather than working to eliminate herbicides from our parks, SFRPD seems to be looking for substitutes for Roundup. Thus far, these two chemicals have been used only in Nursery areas – the GGP Nursery, and the nursery at the Botanic Gardens. SF Forest Alliance reiterates our commitment to working toward No Toxic Pesticides in our parks. We recognize that it will be an uphill battle, as all current interests are in continuing pesticide use. Nevertheless, we believe that it is possible and is a worthwhile and environmentally-friendly goal for San Francisco. We finally received all the 2016 pesticide use reports from San Francisco Recreation and Parks Department (SFRPD), including of course the Natural Resources Department (formerly the Natural Areas Program). 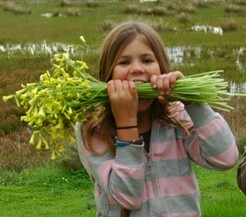 Coincidentally, it’s oxalis season, and by the logic of the NRD – it’s Garlon time. Of which more below. In April 2016, SF Department of the Environment rolled out its new guidelines for pesticide use. 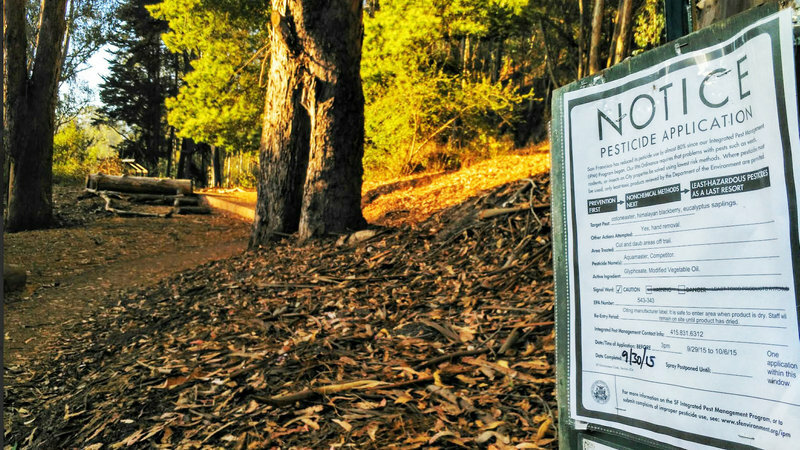 Since then, the other parks sections nearly eliminated pesticides – but not NRD. They reduced their use of Roundup quite drastically (thankfully, since it’s a probable carcinogen). But they increased their usage of Garlon and Imazapyr. San Francisco Recreation and Parks Department (ex Harding Golf Course, which is under a management contract with the PGA Tour) has all but stopped using herbicides – except for the so-called Natural Resources Department. Looking at the whole of 2016, SFRPD used pesticides 159 times. Of those, 143 applications were by the NRD. 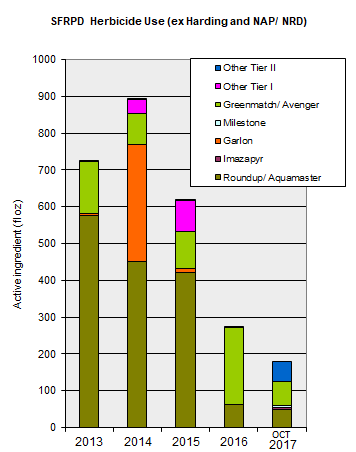 NRD used more of nearly all Tier I and Tier II herbicides. It used 48% of the total Roundup SFRPD applied; 100% of the Garlon; 100% of the Imazapyr (Stalker, Polaris); and 99% of the Milestone VM. The good news is that NRD has succeeded in reducing herbicide use, mainly by cutting back sharply on Roundup. Even if not as much as other SFRPD departments, it’s progress. It is still not down to 2009 or even 2008 levels, but has reduced substantially from 2013, which was peak pesticide for NRD (then NAP). Since they are following the same regimen and using NRD staff, we include the PUC data along with NRD information. We thought we’d take a look at which parks they treated most often with herbicides in 2016. Bayview Hill was the clear “winner” with 34 applications. McLaren Park was hit 27 times, and Twin Peaks 25 times. 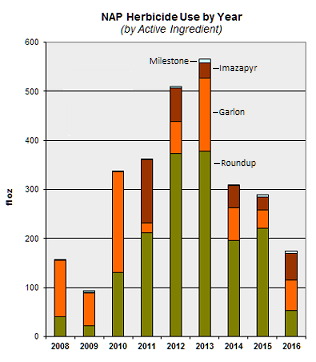 Glen Canyon had 10 applications of herbicides, and Mt Davidson was herbicided 8 times. herbicides”. Use only for targeted treatments of high profile or highly invasive exotics via dabbing or injection. May use for targeted spraying only when dabbing or injection are not feasible. It’s been “High Priority to Find Alternative” in all the years we’ve been studying this issue. Here’s the solution: Stop obsessing over oxalis. The only current use for Garlon in SFRPD is battling oxalis in “Natural Areas.” It’s been used 23 times in 2016 by NRD – and zero times by all the other departments. 1) It’s already part of the ecological food web in our city, providing nectar to honey-bees, bumblebees, butterflies and other pollinators. 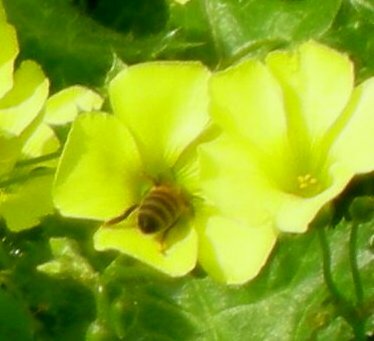 Ironically, the pollination doesn’t benefit the oxalis, which doesn’t set seed in San Francisco. 2) It’s good for wildlife, providing food for gophers, a foundation species that in turn feed predators from hawks and owls and herons to coyotes and foxes. 3) The myth is that oxalis leaves the ground bare after it dies down in summer. Actually, it enriches the soil with phosphorus, which benefits the grasslands in which it grows. 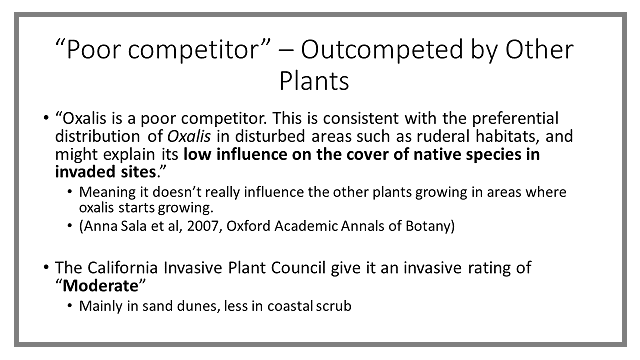 4) Oxalis has little impact on native plants. NRD argues that oxalis takes over grasslands and destroys them, particularly the native grasses. However, grasslands in most of California including San Francisco are dominated non-native grasses. The change occurred over 100 years ago, when these grasses were planted for pasture. So the grassland that NAP is defending with herbicides are primarily non-native anyway. 5) Kids love it, and it’s edible. Parents know that children will often nibble on “sourgrass” – indeed, so do parents sometimes! Adding toxic herbicides is a poor idea, especially since it is usually applied during the flowering season. 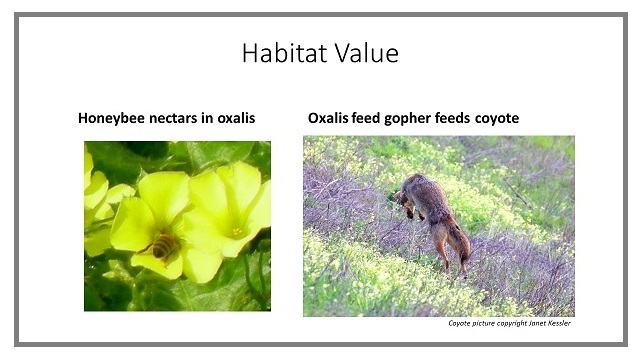 “There’s no sign that oxalis has a negative impact on wildlife, and plenty of evidence it’s already part of the ecological food web of our city. The evidence also suggests it’s not having a negative effect on other plants in San Francisco either. Lots of people find this flower attractive; one writer described it as the city smiling with Bermuda buttercups. Toxicological Risks of Agrochemical Spray Adjuvants: Organosilicone Surfactants May Not Be Safe.